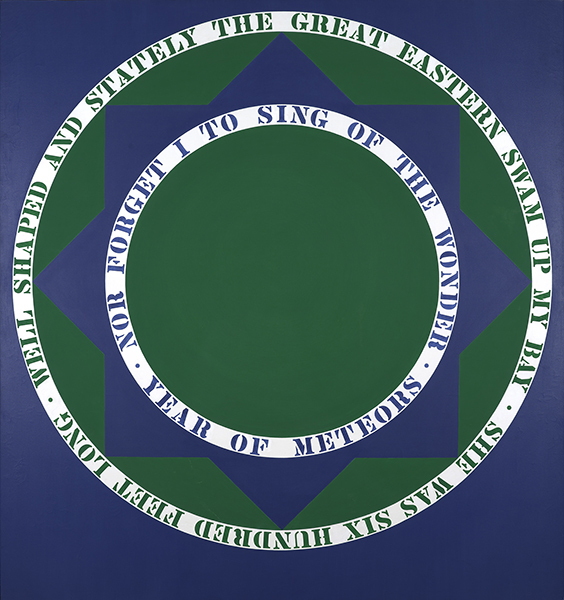 Robert Indiana (American, 1928-2018). Polychrome aluminum, edition AP 2 0f 2; 96 x 96 x 48 inches (243.8 x 243.9 x 121.9 cm) Private Collection. © 2018 Morgan Art Foundation Ltd. / Artists Rights Society (ARS), NY. Photograph courtesy of the Albright-Knox Art Gallery, Buffalo, NY. 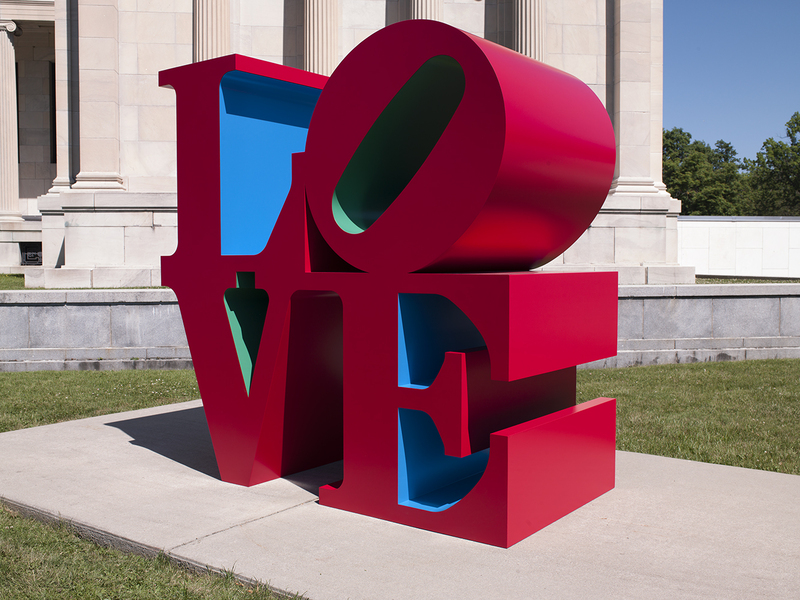 This exhibition explores the more than five-decade career of one of America’s most beloved artists, Robert Indiana (American, 1928–2018). A selective survey of Indiana’s sculpture, it also includes numerous paintings, prints, and drawings, highlighting how Indiana’s thinking in visual form crossed different media. 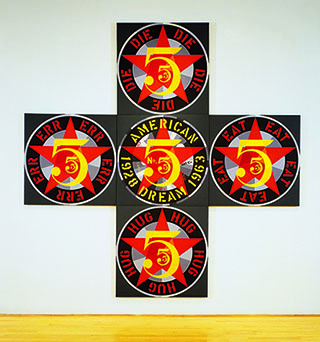 This quintessentially American artist returned frequently to autobiographical motifs, symbols, and imagery, often after many decades of quiet reflection and rumination, building a corpus of work that ever more meaningfully reflected what it meant to be an American artist—and what it meant to be Robert Indiana—as the years passed. While LOVE will likely always remain the artist’s greatest contribution in the public imagination, his work beyond and apart from this memorable image places Indiana among the great American artists of the second half of the twentieth century. This exhibition introduces lesser-known late works—the Vinalhaven Woods, bronze editions of sculptures from different eras in his career, and the never-before shown marble LOVEs—to make the case for the breadth and import of Indiana’s achievement. Robert Indiana (American, 1928-2018). Oil on canvas; 90 x 84 inches (228.6 x 213.4 cm). Collection Albright-Knox Art Gallery, Buffalo, New York; Gift of Seymour H. Knox, Jr., 1962 (K1962:13). © 2018 Morgan Art Foundation Ltd. / Artists Rights Society (ARS), New York. Photograph courtesy of the Albright-Knox Art Gallery, Buffalo, NY. Robert Indiana (American, 1928-2018). Gesso and oil on wood with iron-and wooden-wheels; 76 x 18 x 13 inches (193 x 45.7 x 33 cm). Collection Albright-Knox Art Gallery, Buffalo, New York; Gift of Seymour H. Knox, Jr., 1963 (K1963:9). © 2018 Morgan Art Foundation Ltd. / Artists Rights Society (ARS), New York. Photograph courtesy of the Albright-Knox Art Gallery. Robert Indiana (American, 1928-2018). Oil on canvas; 5 panels, overall: 144 x 144 inches (365.8 x 365.8 cm). Collection Art Gallery of Ontario, Toronto; Gift from the Women’s Committee Fund, 1964. © 2018 Morgan Art Foundation Ltd. / Artists Rights Society (ARS), New York. Robert Indiana (American, 1928-2018). Gesso and oil and wood on wood with iron wheels; 84 x 35 1/2 x 17 inches (213.4 x 90.2 x 43.2 cm). Private Collection. © 2018 Morgan Art Foundation Ltd. / Artists Rights Society (ARS), New York. Photograph courtesy of Dennis and Diana Griggs. 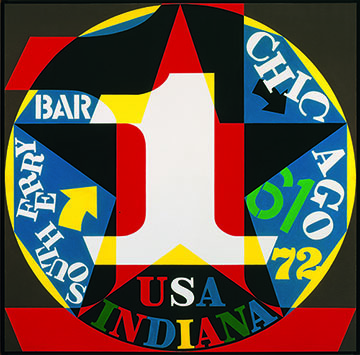 Robert Indiana (American, 1928-2018). Oil on canvas; 72 x 72 inches (182.9 x 182.9 cm). Collection McNay Art Museum, San Antonio, Texas; Gift of Robert L.B. Tobin. © 2018 Morgan Art Foundation Ltd. / Artists Rights Society (ARS), New York. Photograph courtesy of the McNay Art Museum, San Antonio, Texas.